If you choose to take drugs, then get done when they stay in your system, any resulting consequences are of your own doing – so deal with them like a mature adult. It’s called taking personal responsibility. How hard is this to understand? My response? Sue Bradford is right, for once. Here’s a post from my old blog that explains why. What is it with right-wingers and their fetish for trained circus seals? Popular among right-wingers is the following proposed solution to the problem of welfare abuse: make welfare beneficiaries jump through hoops. Exactly which hoops it’s thought welfare beneficiaries should jump through depends on the right-winger making the proposal. What particularly irks me is the suggestion put forward here. Shouldn’t one have to pass a urine test to get a welfare cheque because I have to pass one to earn it for them?? Please understand – I have no problem with helping people get back on their feet. I do on the other hand have a problem with helping someone sit on their arse drinking piss & smoking dope all day. Surely, paying people to sit on their arses drinking piss and smoking dope all day is one of the better uses of government money. But I digress. There is an obvious problem with the proposal. If you make passing a urine test a condition of eligibility for the dole, this will have the unintended consequence of inducing people to apply for the sickness benefit as alcoholics or drug addicts, where failing a urine test is a condition of eligibility. The truth is, there is only one solution to the problem of welfare abuse – remove the state entirely from the provision of welfare and devolve that responsibility to voluntary charities and private insurance companies – and only one political party advocating this solution – Libertarianz. Here are a couple of ideas which may (or may not) be part of the soon-to-be-announced Libertarianz transitional social welfare policy. First, stop treating “alcoholism” and “drug addiction” as afflictions which qualify the afflicted for the sickness benefit. Drug addiction is a lifestyle choice, not a disease. Second, put a six month time limit on the unemployment benefit. I don’t mean that beneficiaries should cease to receive the dole after they’ve been on it six months. I mean that all unemployment beneficiaries should cease to receive the dole six months after the policy is implemented. So, if the policy were to be implemented tomorrow, the unemployment benefit would be off the WINZ menu come February next year. Six months should be ample time to find a job. 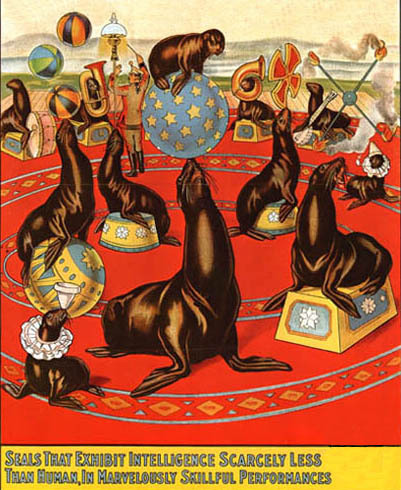 Perhaps some right-wingers might offer employment opportunities for professional trained circus seals. Straight talk, I like it!